The Irish Open is to be staged in Northern Ireland twice over the next three years - at Royal County Down in 2015 and the Lough Erne resort in 2017. The news was confirmed by European Tour Chief Executive George O'Grady on Thursday, with the Stormont Executive providing significant funding. 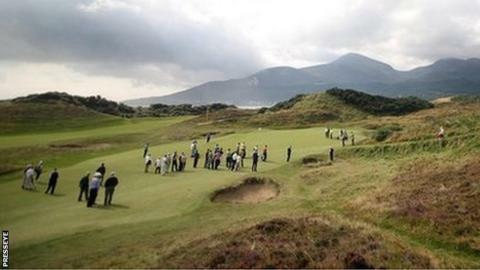 Royal County Down will host the event for the first time in 75 years, with the dates confirmed as 28-31 May, 2015. The Lough Erne course will be staging the Irish Open for the first time. Thursday's news will increase the optimism that the Open Championship could return to Northern Ireland for the first time since the only staging of the event in the province at Royal Portrush in 1951. Northern Ireland's First Minister Peter Robinson attended Thursday's announcement at Royal County Down and he said talks are continuing with Open organisers, the Royal & Ancient, over the major championship. "We are talking to them and we have been talking to them for some time," the First Minister told BBC Sport. "We will continue to make every effort we can in order to bring the Open to Northern Ireland." Despite the feel-good factor after the 2012 Portrush event, within weeks R&A chief executive Peter Dawson appeared to ruled out an imminent Open Championship return to Northern Ireland. "There would be much work to do for an Open ever to go to Portrush [again]," said Dawson in his July 2012 comments. "We have been there before. It's always, to an extent, been on our radar and our championship committee, I'm sure, will continue to evaluate it." Royal Portrush became the first Northern Ireland venue to host the Irish Open for 59 years in 2012. The tournament was the first-ever sold-out event on the European Tour as huge crowds turned out to watch a field which included homegrown major winners Rory McIlroy, Graeme McDowell and Darren Clarke. The Northern Ireland Executive provided funding in the region of £1.5m for the 2012 event and a similar investment will be required this time round although Tourism Minister Arlene Foster would be drawn on the sums involved. Royal County Down is one of the most renowned links in the world and, with extra grandstands likely to be erected, crowds in excess of 20,000 are expected to flock to the Newcastle course each day. The club staged the Senior British Open from 2000 to 2002 and the Walker Cup was also held there in 2007. "There is one less week between the US Open and the Open Championship next year, so the dates we have selected at the end of May give us the best chance of getting the strongest possible field," said O'Grady. "Rory McIlroy put the idea in my head at a European Tour event in Shanghai and it progressed from there. "We will be showcasing one of the world's absolute great golf courses and there are some lovely vantage points. We want to bring as many people here as possible. The European Tour chief also added that the Northern Ireland Executive had agreed to provide "help" with the running of this year's event at Fota Island in county Cork and further stagings of the tournament in the Republic of Ireland in the coming years. Englishman Paul Casey was the winner at Carton House last year, while this year's tournament will be played at Fota Island. O'Grady said at Thursday's press conference at Royal County Down that Fota Island is currently the favourite to host the 2016 Irish Open. However, the European Tour chief did reveal that he had also held talks with new Doonbeg owner Donald Trump about the possibility of the event being held at the county Clare venue in the coming years.